As the third-leading cause of cancer deaths in the United States, and with a 5-year survival rate of just 8 percent, pancreatic cancer is one of the most lethal forms of the disease. Currently available treatments are largely ineffective, so there is a desperate need for better therapeutic options, explained Dr. Bahary. In the first study, published in the January issue of Cancer Medicine, first author Mashaal Dhir, MD, an oncologic surgical fellow at UPMC, and colleagues used DNA sequencing to look for gene changes in over 100 patient samples of advanced gastrointestinal cancers, including colorectal and pancreatic tumors. One patient’s pancreatic tumor had a mutation in the ALK gene. Genetic mutations involving ALK have been identified in several different types of cancer, including those of the breast, colon, and lung, and drugs targeting this pathway have been successfully used for treatment of these tumors. The second study, published online in the Journal of the National Comprehensive Cancer Network (JNCCN), took a closer look at ALK mutations in pancreatic cancer. Co-lead authors Aatur Singhi, MD, PhD, assistant professor of pathology at UPMC, and Siraj Ali, MD, PhD, director of clinical development and medical affairs, Foundation Medicine Inc., Cambridge, Massachusetts, performed comprehensive genomic profiling of more than 3,000 pancreatic cancers. Elastin is a protein in connective tissue that allows many tissues in the body to resume their shape after stretching or contracting. Elastin helps skin to return to its original position when it is poked or pinched. Verhoeff’s stain forms a variety of cationic, anionic and non-ionic bonds with elastin, the main constituent of elastic fiber tissue. Elastin has a strong affinity for the iron-hematoxylin complex formed by the reagents in the stain and will hence retain dye longer than other tissue elements, which allows elastin to remain stained while other tissue elements are decolorized. Elastic fibers and cell nuclei are stained black, collagen fibers are stained red, and other tissue elements including cytoplasm are stained yellow. You’ll receive 25% off your VVG stain every day in June. Contact Lori at the McGowan Core Histology Lab and ask about our VVG specials. Email perezl@upmc.edu or call 412-624-5265. As always, you will receive the highest quality histology in the quickest turn-around time. Hepatocytes are characterized by variations in chromosome content known as polyploidy. Polyploidy is defined as an increase in the entire chromosome set within the cell. For example, in humans, diploid (2n) cells contain 46 chromosomes while polyploid cells that are tetraploid (4n) contain 92 chromosomes. Interestingly, polyploid hepatocytes comprise >90% of hepatocytes in adult mice and 50% in adult humans. The goal of the lab is to characterize the functional role of polyploid hepatocytes in the context of liver function and regeneration. To study the differences between diploid and polyploid hepatocytes the researchers utilized liver-specific knockout mice lacking transcription factors E2f7 and E2f8 (E2f7/E2f8-lko). The analyses revealed E2f7/E2f8-lko mice contain 10 times more diploid hepatocytes and 3- to 10-fold fewer polyploid cells compared to controls. Ms. Guzik collaborated with the team to design and perform an experiment that would enable them to determine if the ploidy defect was stable. For this assay, they transplanted E2f7/E2f8-lko hepatocytes from adult (2 months) donors into Fah-/- recipients, a liver repopulation model. After isolating the hepatocytes from the repopulated livers, flow cytometry was used to discriminate between the donor and host hepatocytes, and determine the ploidy states of the repopulated livers. Since the host and donor cells had different murine MHC haplotypes the team could differentiate between them by staining the hepatocytes with antibodies against the H-2Kq antigen (donor cells) and H-2Kd antigen (host cells). The flow analyses revealed that >90% of the cells in the repopulated livers were H-2Kq+, indicating that hepatocytes from E2f7/E2f8-control and knockout mice successfully repopulated the livers of the host mice (Figures 1A and 2A). The team’s ploidy analyses revealed the livers repopulated with E2f7/E2f8-control cells contained predominantly polyploid (4c and 8c) hepatocytes (Figure 1B). This was expected as wild-type hepatocytes readily polyploidize during liver repopulation. 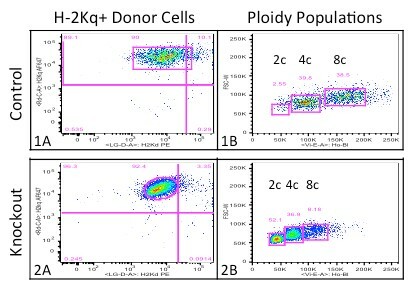 However, most cells in the livers repopulated with E2f7/E2f8-lko donors were diploid (2c) hepatocytes (Figure 2B). This indicated that the E2f7/E2f8-lko hepatocytes did not polyploidize during liver repopulation. Therefore, the flow analyses revealed that the E2f7/E2f8-lko ploidy defect was stable and E2f7/E2f8-lko hepatocytes do not polyploidize when forced to undergo multiple rounds of cell division. Mr. Wilkinson and Ms. Alencastro are thankful for the expertise and assistance provided by Ms. Guzik in developing, optimizing, and performing this experiment, and look forward to continued work with the McGowan Institute Flow Cytometry Core for future hepatic ploidy analyses. Thanks to our researchers, the McGowan Flow Facility has had a very productive year. Scheduled appointment time has doubled in the past 6months. As some researchers have recently realized, appointment requests for ‘next week’ can no longer be accommodated as easily as they once were. In order to better serve you and respect everyone’s valuable time and work, we feel it is necessary to adapt our current scheduling and billing policy to better utilize the available time on the Aria cell sorter. No changes are currently planned for the Quant. Changes will become effective on July 1, 2017 and can be accessed on our website. For details about the new policy, please click here. Like drag car racers revving their engines at the starting line, stem cells respond more quickly to injury when they’ve been previously primed with one dose of a single protein, according to a study from the Stanford University School of Medicine. Mice given the priming protein recover muscle function more quickly after damage, their skin heals more rapidly, and even the shaved area around the injury regrows hair more quickly, the study found. Harnessing the power of this protein may one day help people recover more quickly from surgery or restore youthful vigor to aging stem cells. Dr. Rando, who also directs Stanford’s Glenn Center for the Biology of Aging, is the senior author of the study, which will be published in Cell Reports. Former postdoctoral scholar Joseph Rodgers, PhD, is the lead author. Dr. Rodgers is now an assistant professor of stem cell biology and regenerative medicine at the University of Southern California. Normally, adult, tissue-specific stem cells are held in a kind of cellular deep freeze called quiescence to avoid unnecessary cell division in the absence of injury. In a 2014 paper published in Nature, Drs. Rodgers and Rando showed in laboratory mice that an injury to the muscle of one leg caused a change in the muscle stem cells of the other leg. These cells entered what the researchers called an “alert” phase of the cell cycle that is distinct from either fully resting or fully active stem cells. The fact that muscle stem cells distant from the injury were alerted indicated that the damaged muscle must release a soluble factor that can travel throughout the body to wake up quiescent stem cells. Dr. Rodgers and his colleagues found that a protein called hepatocyte growth factor, which exists in a latent form in the spaces between muscle cells and tissue, can activate a critical signaling pathway in the cells by binding to their surfaces. This pathway stimulates the production of proteins important in alerting the stem cells. But it wasn’t known how HGF itself became activated. In the new study, Dr. Rodgers and his colleagues identified the activating factor by injecting uninjured animals with blood serum isolated from animals with an induced muscle injury. (Mice were anesthetized prior to a local injection of muscle-damaging toxin; they were given pain relief and antibiotics during the recovery period.) After 2.5 days, the researchers found that muscle stem cells from the recipient animals were in an alert state and completed their first cell division much more quickly than occurred in animals that had received blood serum from uninjured mice. The researchers found that the serum from the injured animals had the same levels of HGF as the control serum. However, it did have increased levels of a protein called HGFA that activates HGF by snipping it into two pieces. Treating the serum with an antibody that blocked the activity of HGFA eliminated the recovery benefit of pretreatment, the researchers found. In a related experiment, exposing the animals to a single intravenous dose of HGFA alone two days prior to injury helped the mice recover more quickly. They scampered around on their wheels sooner and their skin healed more quickly than mice that received a control injection. They also regrew their hair around the shaved surgical site more completely than did the control animals. “Just like in the muscles, we saw the responses in the skin were dramatically improved when the stem cells were alerted,” Dr. Rando said. In addition to pinpointing possible ways to prepare people for surgeries or other situations in which they might sustain wounds, the researchers are intrigued by the role HGF and HGFA might play in aging. It’s known that the pathway activated by these proteins is less active in older people and animals. The study explored the change in brain activity during simple motor tasks performed through virtual reality in both 2-D and 3-D. The researchers wanted to know if the motor cortical neurons would automatically adjust their sensitivity to direction when presented with a wide range of possible directions instead of a narrow one. 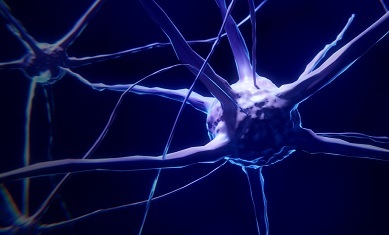 Previous research in the field has suggested that this phenomenon, called dynamic range adaptation, is known to occur in neurons sensitive to sound, touch, and light — prompting the researchers to ask if the same phenomena would apply to neurons in the motor system that are associated with movement. Illustration: Carnegie Mellon University Materials Science and Engineering. 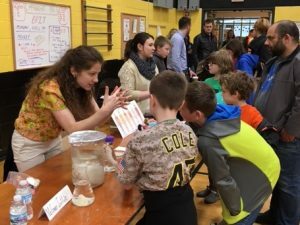 Stephen Badylak, DVM, PhD, MD, recently represented the McGowan Institute at an educational outreach activity held at McKnight Elementary School in the North Allegheny School District. 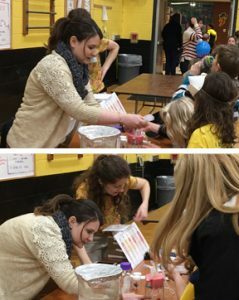 Michelle Scarritt, PhD, and Abby Stahl explained to students and their families how different human anatomy systems function. The investment by Philips and UPMC will bring more than capital to the company, with both organizations offering resources and expertise to support ALung’s work. ALung’s Board of Directors will be strengthened with new members from Philips and UPMC Enterprises. Adam Seiver, MD, will join the board as a representative from Philips, where he serves as the Chief Medical Officer of Philips Patient Care and Monitoring Systems. 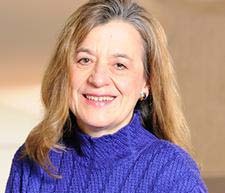 Joining from UPMC will be Jeanne Cunicelli, Executive Vice President of UPMC Enterprises. Ms. Cunicelli has more than two decades of investment and advising experience in the life sciences industry. “We are excited to partner with ALung, whose mission reflects our own: to dramatically improve patient outcomes and the cost-effectiveness of care by applying cutting-edge science and technology,” said Steven Shapiro, MD, Chief Medical and Scientific Officer of UPMC. 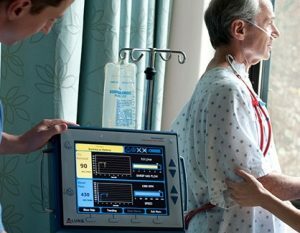 UPMC was the first hospital system in the United States to use the Hemolung RAS on an emergency use basis. Joining Philips and UPMC in the Series C round were new and existing investors including Abiomed, The Accelerator Fund, Allos Ventures, Birchmere Ventures, Blue Tree Ventures, and Riverfront Ventures. Raymond James & Associates, Inc., acted as lead placement agent for the transaction. A novel gene therapy using CRISPR genome editing technology effectively targets cancer-causing “fusion genes” and improves survival in mouse models of aggressive liver and prostate cancers, University of Pittsburgh School of Medicine researchers report in a study published online recently in Nature Biotechnology. McGowan Institute for Regenerative Medicine affiliated faculty members George Michalopoulos, MD, PhD, Professor and Chairman of the Department of Pathology at the University of Pittsburgh, and Satdarshan Monga, MD, Endowed Research Chair in Experimental Pathology and the Vice-Chair of the Division of Experimental Pathology, Department of Pathology at Pitt, are co-authors on the study. “This is the first time that gene editing has been used to specifically target cancer fusion genes. It is really exciting because it lays the groundwork for what could become a totally new approach to treating cancer,” explained lead study author Jian-Hua Luo, MD, PhD, professor of pathology at Pitt’s School of Medicine and director of its High Throughput Genome Center. Dr. Luo and his team had previously identified a panel of fusion genes responsible for recurrent and aggressive prostate cancer. In a study published earlier this year in the journal Gastroenterology, the team reported that one of these fusion genes, known as MAN2A1-FER, also is found in several other types of cancer, including that of the liver, lungs, and ovaries, and is responsible for rapid tumor growth and invasiveness. To conduct the study, the researchers used mouse models that had received transplants of human prostate and liver cancer cells. Editing the cancer fusion gene resulted in up to 30 percent reduction in tumor size. None of the mice exhibited metastasis and all survived during the 8-week observation period. In contrast, in control mice treated with viruses designed to cut out another fusion gene not present in their tumors, the tumors increased nearly 40-fold in size, metastasis was observed in most animals, and all died before the end of the study. The new findings suggest a completely new way to combat cancer. “Other types of cancer treatments target the foot soldiers of the army. Our approach is to target the command center, so there is no chance for the enemy’s soldiers to regroup in the battlefield for a comeback,” said Dr. Luo. 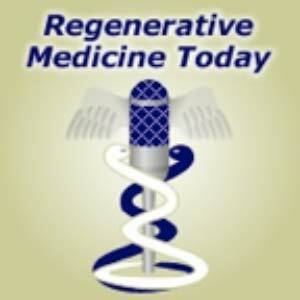 Another advantage over traditional cancer treatment is that the new approach is very adaptive. A common problem that renders standard chemotherapies ineffective is that the cancer cells evolve to generate new mutations. Using genome editing, the new mutations could be targeted to continue fighting the disease, Dr. Luo noted. Illustration: Cancer cell line with CRISPR-based gene therapy delivered via viruses. University of Pittsburgh Medical Center. 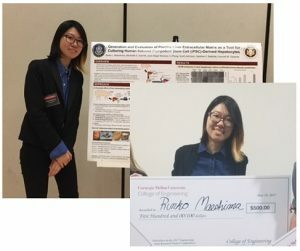 Rinko Maeshima is an undergraduate Research Assistant at the McGowan Institute for Regenerative Medicine and will graduate from Carnegie Mellon University (CMU) majoring in Chemical and Biomedical Engineering. Ms. Maeshima works in the laboratory of McGowan Institute’s Deputy Director Stephen Badylak, DVM, PhD, MD, Professor in the Department of Surgery and Director of the Center for Pre-Clinical Tissue Engineering within the Institute. Investigating how iPS-derived hepatocytes respond in 2D culture to decellularized porcine liver scaffolds through DNA quantification, microscopy and DAPI staining. Physiologically evaluating iPS-derived macrophages through heat map and their response to cytokines, and comparing them to cell line macrophages. Ms. Maeshima will continue her studies at CMU in the Integrated Master’s program to obtain a Master’s degree in Mechanical Engineering. #171 –– Dr. George Gittes is is the Benjamin R. Fisher Chair of Pediatric Surgery and Surgeon-in-Chief, Children’s Hospital of Pittsburgh, Director of Surgical Research, Children’s Hospital of Pittsburgh, and Professor of Surgery and Professor of Pediatrics, University of Pittsburgh School of Medicine. 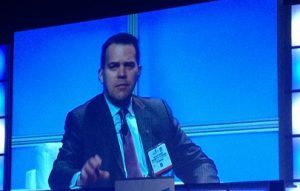 Dr. Gittes discusses his research in pancreatic issues as well as his work with the Pediatric Device Initiative. Title: Impact of genomic profiling on the treatment and outcomes of patients with advanced gastrointestinal malignancies. Summary: The impact of genomic profiling on the outcomes of patients with advanced gastrointestinal (GI) malignancies remains unknown. The primary objectives of the study were to investigate the clinical benefit of genomic-guided therapy, defined as complete response (CR), partial response (PR), or stable disease (SD) at 3 months, and its impact on progression-free survival (PFS) in patients with advanced GI malignancies. Clinical and genomic data of all consecutive GI tumor samples from April, 2013 to April, 2016 sequenced by FoundationOne were obtained and analyzed. A total of 101 samples from 97 patients were analyzed. Ninety-eight samples from 95 patients could be amplified making this approach feasible in 97% of the samples. After removing duplicates, 95 samples from 95 patients were included in the further analysis. Median time from specimen collection to reporting was 11 days. Genomic alteration-guided treatment recommendations were considered new and clinically relevant in 38% (36/95) of the patients. Rapid decline in functional status was noted in 25% (9/36) of these patients who could therefore not receive genomic-guided therapy. Genomic-guided therapy was utilized in 13 patients (13.7%) and 7 patients (7.4%) experienced clinical benefit (6 PR and 1 SD). Among these seven patients, median PFS was 10 months with some ongoing durable responses. Genomic profiling-guided therapy can lead to clinical benefit in a subset of patients with advanced GI malignancies. Attempting genomic profiling earlier in the course of treatment prior to functional decline may allow more patients to benefit from these therapies. Source: Cancer Med. 2017 Jan;6(1):195-206. doi: 10.1002/cam4.992. Epub 2016 Dec 28.